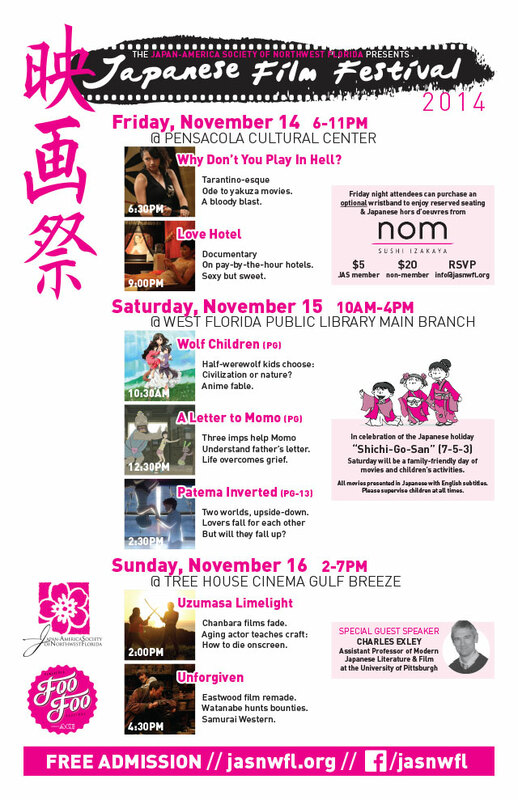 As part of Pensacola’s inaugural Foo Foo Festival, the Japan-America Society of Northwest Florida will present the 2014 Japanese Film Festival on November 14, 15 and 16. Each day will be located at a different venue and will showcase a different aspect of contemporary Japanese cinema. Admission is free on all three days. 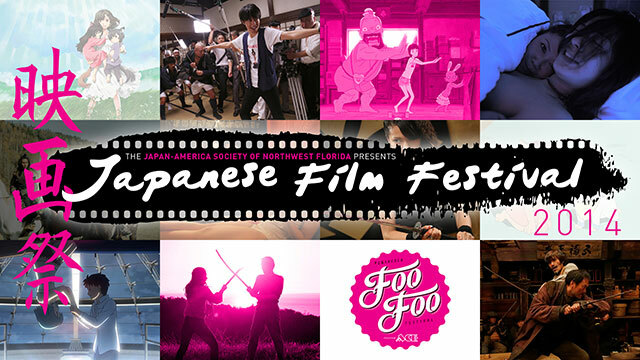 With seven movies screened over three days, film buffs and fans of Japanese culture will have plenty to enjoy. “Why Don’t You Play In Hell?” is a bloody, comic ode to yakuza gangster movies and 35mm filmmaking that has been likened to American director Quentin Tarantino’s filmography. “Love Hotel” is a documentary about the ubiquitous short-term hotels used for romantic encounters in Japan. With content including graphic language, violence and sexual situations, Friday night’s movies are definitely for a grown-up audience. Also on Friday, attendees can purchase optional wristbands for $20 (or $5 for JAS members) that grant them access to reserved seating and heavy hors d’oeuvres provided by downtown’s newest restaurant, Nom Sushi Izakaya. Wristbands can be purchased at the event, but advance reservations are appreciated. RSVP by emailing info@jasnwfl.org. “Wolf Children” (rated PG) tells the story of a young woman who falls in love with a werewolf and their two children, who must learn to control their wolf transformations as they grow up in human society. “A Letter to Momo” (rated PG) is about a grieving girl, Momo, and a trio of mischievous spirits who help her understand a letter from her deceased father. “Patema Inverted” (rated PG-13) is a sci-fi adventure about a boy and girl with opposite gravities trying to discover the secret of their upside-down world. November 15 also coincides with the Japanese festival “Shichi-Go-San” (literally “7-5-3”), a day celebrating the coming of age of Japanese children. Kids will enjoy participating in Japanese activities, such as making and decorating their own “chitose ame” (or “thousand-year candy”) bags, learning to write their name in Japanese script and posing with the samurai and kimono dress-up wall. On Sunday, November 16, the festival will take place at the Tree House Cinema in Gulf Breeze. Sunday’s films are “Uzumasa Limelight” and “Unforgiven.” “Uzumasa Limelight” follows an aging “kirare-yaku,” or samurai stuntman, who wants to teach his craft to a young apprentice even as the studio filmmaking process changes around him. “Unforgiven” is a remake of the Academy Award-winning 1992 Clint Eastwood movie, set in Meiji-era Hokkaido and starring Ken Watanabe in the Eastwood role. In between Sunday’s movies, Dr. Charles Exley from the University of Pittsburgh will give a presentation on Japanese cinema, explaining why Japanese “jidaigeki” movies are so compatible with the sensibility of Hollywood Westerns. All seven movies will be screened in Japanese with English subtitles. Click the links below to view and join the Facebook events, and please share with your friends!